Detroit’s rich architecture along the horizon offers photo opportunities you won’t want to miss! Detroit’s rich architecture along the horizon offers photo opportunities you won’t want to miss. Upping the excitement (and enhancing the views), this helicopter flight soars the skies with its doors off! Get up-close views of the towering skyline and lush greenery as the city wind embraces you. The rush of the open sky is a feeling you’ll never forget! 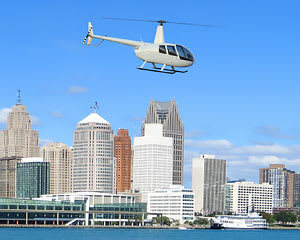 Take a 15 minute helicopter flight of Detroit's south suburbs and skyline. Travel with the doors off for even better views! Soar high along the Detroit River and marvel at Fighting Island just over the Canadian border. Swoop over Grosse Ile, Riverview, and Wyandotte. Travel high above scenic Wayne County! America’s manufacturing beacon offers phenomenal feats of architecture and landscaping. By discovering it all with a doors-off flight, you’ll witness the area from a refreshing angle and garner a newfound appreciation for it. Fly today!